All inclusive 3 course dinner, including the boat and the dinner, excluding the drinks. About the restaurant Dinner Cruise Amsterdam - Varend Restaurant for groups from 10 up to 35 persons. Enjoy the Amsterdam canals and enjoy special dishes on the table. It seems almost a fairytale but in Amsterdam everything is possible! Try this underway restaurant overlooking the canals and streets of the capital. It is a special experience; for groups, a special occasion or just because you want to pamper yourself. Great food, and don’t forget to look outside occasionally! 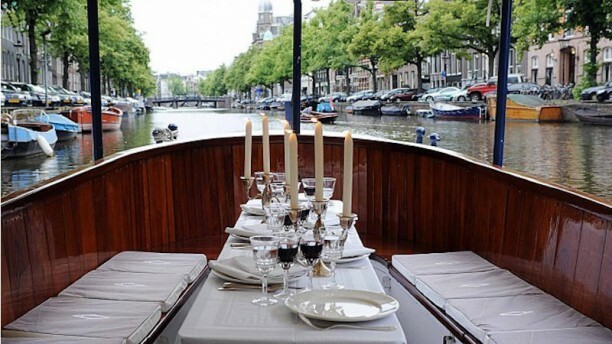 How to get to the restaurant Dinner Cruise Amsterdam - Varend Restaurant for groups from 10 up to 35 persons.